From trains to automobiles. After lunch and shopping at a local shopping centre we returned to Nagoya Station and transferred to the Meitetsu Line for a quick trip to Sako. Toyota started of as a manufacturer of weaving machines before moving into cars. The museum is located in their original factory. There is a hands on technology play area where you can discover principles such as wind resistance, braking and gears for yourself. Feeling like an Doctor Nefario on an electric scooter. The weaving machinery looked fascinating, but we had very limited time so headed quickly to the automotive area. 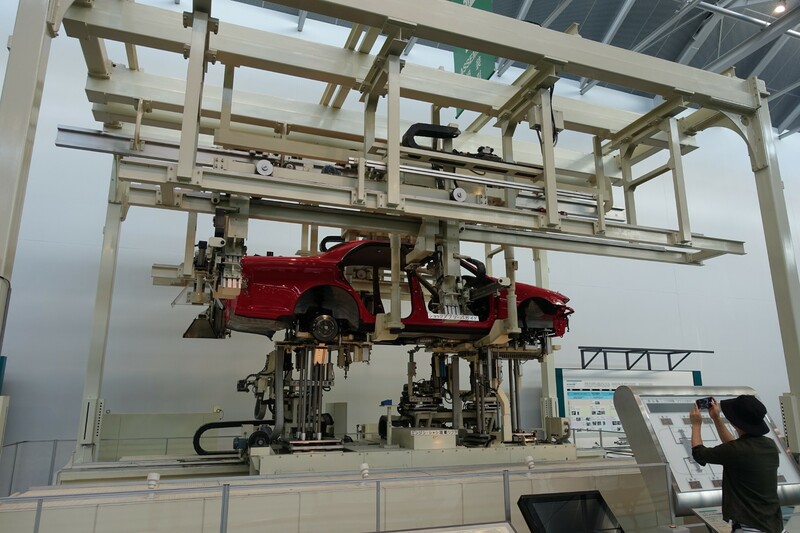 The huge, mostly operational factory machinery runs demonstrations like metal pressing, robotic welding and assembly. Though we missed out on the Toyota factory tour we probably saw more here, if the previous Mazda tour was anything to go by. Well worth a visit for anyone interested in machinery, textiles or cars.